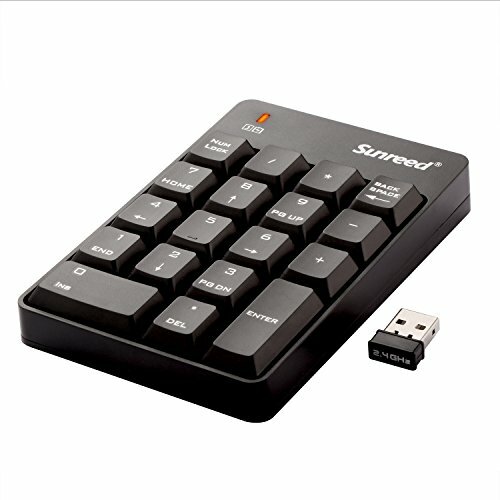 Sunreed 18 Keys Wireless Numeric Keypad is a perfect accessory to complete your workspace. Just need to insert the receiver to the device's USB interface, perfectly creating a dedicated space for numeric data entry. Use the Number Pad, you will find your work efficiency and productivity will be improved greatly! 1. Plug and Play: Just plug the receiver into the USB port, no device drivers required. 2. Portable: Ergonomic design, thin and compact Mini Number pad can be put in a laptop bag or briefcase for efficiently entering data wherever you go. Convenient to carry and store. 3. Auto Sleep: No power button required, automatically enter the hibernation mode. 4. Long key life: More than 10 million strokes times. Compatible with PC and desktop computers that have Windows XP / Vista / 7 / 8 / 10 operating systems. Any question with the mini USB Number Pad during use , please kindly contact us to get the best after-service.